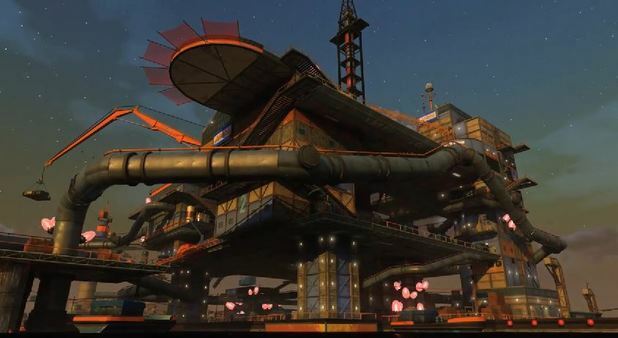 Sunset Overdrive’s first major content update is great! But… very short. Sunset Overdrive was easily this year’s greatest surprise, and it was easy to have spent upwards of 20 hours with the campaign and side-quests, not to mention the great multiplayer mode, Chaos Squad. 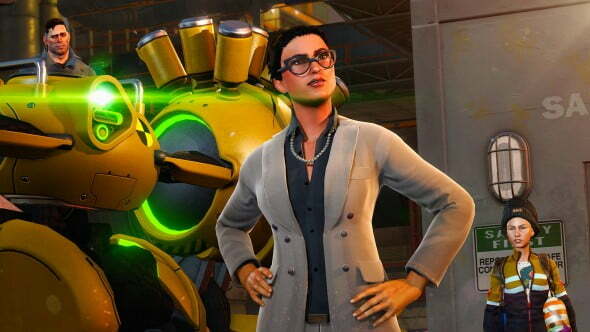 But like all games looking to make a splash these days, Sunset Overdrive shipped with an optional Season Pass for just $20. The first major content drop came this week, titled The Mystery of the Mooil Rig, and while it’s more of the same great gameplay that we loved from the campaign, it does come in at a measly 3 hours. The Mystery of the Mooil Rig sends you out to search for a missing Brylcreem, the armless/legless scout troop leader from the main campaign. Ultimately this search leads you to an oil rig off the coast of Sunset City in search of Brylcreem’s sister, who may have some questionable morals. The story is about as silly and pointless as the main quest’s, but it isn’t short on jokes that mostly work (with a few that don’t). There are a few pop culture references that are already dated, and the game’s characters wisely make references to this so as to keep the humor a bit more timeless. The Mooil Rig is decently sized, but completely traversable. The DLC also adds two new traversal moves to your arsenal and both are surprisingly useful though only in water. One allows your character to dive under water and shoot back up, while the other is similar, but requires you to dive-bomb and press the jump button before launching back out. This allows you to get to those tough to reach locations above water. Like I said, these only add additional capabilities when you’re in the water, so their usefulness around the rest of Sunset City is lacking. Insomniac Games has also packed in a few new weapons (some of which have been out for about a month). Out of all of them, I really only found one or two particularly useful. One of the better weapons allows you to lock onto multiple enemies and fire several self-guiding missiles. None of the missiles do too much damage, nor do they make their way around walls or obstacles, ensuring the gun never feels overpowered. Another covers your character in a bubble shield for a few seconds. There are several others, but none that will be impacting my usual line-up. The characters are, predictably, hilarious. In addition to this, there’s also a small handful of side-quests, all of which are more substantial than most found in the initial release. Therein lies the biggest issue with The Mystery of the Mooil Rig. There just isn’t much content to warrant spending $10. Sure, it’s all pretty high quality, and the general tone certainly fits with the rest of the game, but the main quest was over within two hours, and the side quests might add another hour, bringing the total time-value to just 3 hours. If your time is worth about $3.33 an hour, then you should absolutely feel good about getting The Mystery of the Mooil Rig. It’s really damn good, but it’s also really damn short. The Mystery of the Mooil Rig packs in a small amount of really good content. If you're looking to spend just a few more hours in Sunset City, then you could definitely do worse than this.